floats to the top of the list. And why wouldn’t it? It’s daring, thrill-seeking and completely exhilarating. Not to mention, the incredible sights! Where else could you get a bird’s eye view of the Grand Stand’s coastline? 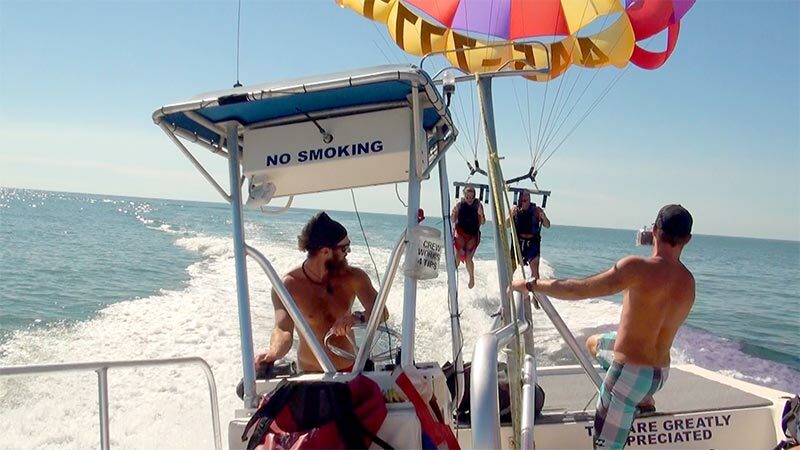 Enter Myrtle Beach Ocean Water Sports – home of parasailing adventures along the Myrtle Beach shore that offers such an experience. The fun will begin the second you arrive (side note: you know you’re in for a wild ride when larger than life smiles – spiked with a sense of mischief – greet you). Located next to Family Kingdom Amusement Park at 3rd Ave South in Myrtle Beach, the parasailing booth is easy to find. Reservations can be made by calling 843-445-7777. The crew does several daily excursions, and groups can choose between single, double or triple flights, depending on weight and weather. Hop on board with one hooting and hollering crowd, making it a party for all.